Join us on Tuesday, June 12 at 5 p.m. at Local 802 in the Clubroom. Come relax between gigs and enjoy live music! Your donations will support the Local 802 Musicians’ Emergency Relief Fund, which helps musicians in need. For more information, contact Bettina Covo at (212) 245-4802, ext. 152. Emile Charlap’s contracting and copying office dominated the New York recording scene for decades. During that time, Emile’s avocation was his personal “rehearsal” band (featuring himself on second trumpet), which gradually expanded from its original quintet format into a full twelve-piece ensemble. 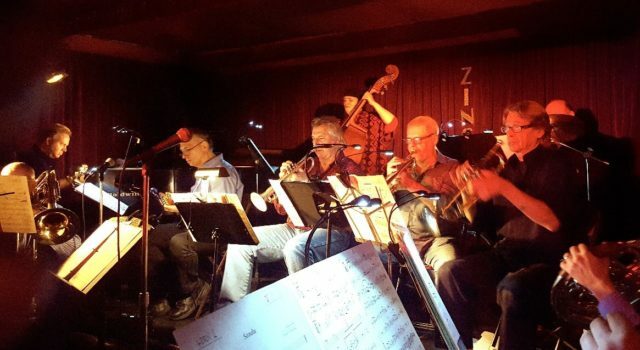 Rehearsing weekly for over 30 years, the group attracted many of New York’s best musicians, and accumulated a repertoire of jazz arrangements by some of New York’s finest.